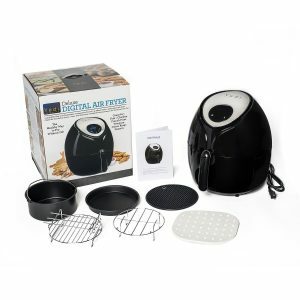 Yedi Houseware Digital Deluxe Air Fryer is a 2018 model new release 8-in-1 electric cooker with a 5.8-quart capacity, a 1700 watt power motor, a digital display and a variety of user-friendly features. It comes with a deluxe accessory kit and great recipes to help especially the beginners. As a rather popular all in one cooker, it is rated 4.8/5 stars by 48 customers on the day of this review. You can also purchase it in the 3.7-quart capacity format that is roughly 35 dollars cheaper at the moment. It will save you on bench space as it will cover a few cookers in one and you only need this single unit to perform a variety of functions, like air frying, baking, roasting. The integrated smart programs include chops, shrimps, steak, chicken, fish, and fries. You can make chicken, fish, tempura, French fries, pizza, onion rings, shish kebob and even desserts. It is a very healthy and tasty way to fry without needing to use any oil. 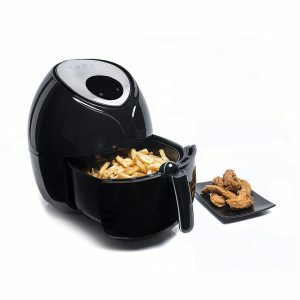 Like with other air fryers this one also uses up to 80% less fat than the regular air fryers. On the blue backlit display panel, you can set the temperature and time and the cooker will shut off automatically when the time is up and the ingredients are cooked, with the auto shut-off feature. It cooks quickly and evenly with the Rapid Air Circulation System just above the electric-coil heating element. The temperature can be set between 180 and 400 degrees Fahrenheit and you can do it in ten-degree increments. You can use the 50 perforated parchment steaming papers to be able to clean easier once you’re done with cooking. The deluxe accessory kit of five pieces is safe to be cleaned in the dishwasher. The 5.8-quart capacity is spacious enough to make enough food for the whole family. There is a Yedi Houseware app for Android and iOS phones and the Yedi website has plenty of recipes with five new added each Monday. You’ll find a user manual with the operation instructions and troubleshooting, a cooking timetable and a starter recipe book. The basket will not be detached by accident as the safety button guard will stop it from happening. It also comes with the automatic shut-off and overheating protection features. It looks sleek and stylish, weighs 18 pounds and measures 16.8 x 15 x 15 inches. You can detach the basket in the middle of cooking to check the progress and put it back in and the timer will resume where it left off. There won’t be any oil spilling as you don’t need to put more than a teaspoon of oil. If you want something quick and easy that makes healthy and tasty meals in your kitchen. If you’ll only cook for yourself you may consider the smaller 3.7 qt unit but you can sort out more stuff in the 5.8-quart cooker. You’ll get your ingredients cooked very nicely- mostly juicy inside and crispy on the outside. You will find a rubber mat, 50 parchment steaming papers, three stainless steel skewers on a multi-purpose rack, an 8-inch pizza pan, an 8-inch cake carrel and a metal holder. It is offered with a year of warranty by Yedi and you’ll get it replaced or refunded if you come across any problems during or after your purchase. This Air Fryer holds certifications from EMC, LVD, REACH, CE, CB, FDA, ETL, ROHS, LFGB, GS and ERP for health and safety. Yedi Houseware has almost four decades of history in the Home and Kitchen Appliances and they are well-known for their great quality products. When I opened the box and removed the air fryer, a tiny piece of black plastic fell out. Apparently it had broken off of the appliance. I have not used it yet and wonder what to do about it. I cannot find where it came from but am hesitant to use it without knowing where it came from. My basket keeps becoming detached without me pushing the button. How can I correct this ? Also yes I do have the plastic safety piece covering it. Please contact the seller via Amazon.com or ask the Amazon Customer Support team, as we only review the products. Thanks.